There is another reason why walking is good for us. It can help women living with depression if it is done in conjunction with emotional and social support. Nottingham University researchers recently unveiled a new exercise programme which involves group motivational support and a low effort walking plan. The key to the new programme -- thanks to two years of study at the School of Nursing, Midwifery and Physiotherapy -- is ‘mentored’ exercise, say the researchers. It hopes to help women who are living with depression, characterised by low levels of physical activity, increasing health and weight problems, low self-esteem and a lack of motivation. Some 40 women with depression in the Nottingham area took part in the research, which entails a pragmatic randomised trial of a standard "exercise-as-usual" programme compared with the new, individually tailored and supported plan. The women volunteers attended sessions at their local authority leisure centre three times a week for four weeks. In each session the women received a half hour motivational coaching session conducted by a health psychologist, in a small friendly group, followed by an individually tailored exercise session on the treadmill in the gym, supervised by a sports therapist. The women exercised alongside each other and, if they needed it, received additional emotional and social support for the duration of their session, though this was slowly reduced as confidence and support from peers within the group grew. Women on the special programme saw a significant improvement in their mood, physical health, sense of well being, self-esteem and quality of life. They felt that they had achieved these gains via a positive, comfortable and unintimidating experience which encouraged regular and continued attendance. Women on the "exercise as usual" programme did not report any significant benefits, were less likely to continue attending and were markedly less enthusiastic. Previous research by the team had found that standard GP-prescribed exercise, usually gym sessions, don’t work well for this group as they find them discouraging and lonely, with many dropping out very early on. The research team’s aim was to come up with a new type of exercise plan that would support and motivate the women for the duration of the treatment. The women who participated in this study are those commonly seen in GP surgeries up and down Britain. The research was conducted by Professor Patrick Callaghan, Elizabeth Khalil and Ioannis Morres at the School of Nursing, Midwifery and Physiotherapy. It was funded by the Burdett Trust for Nursing and has been adopted by East Midlands hub of the Mental Health Research Network, part of the National Institute for Health Research. For more on walking visit this blog. 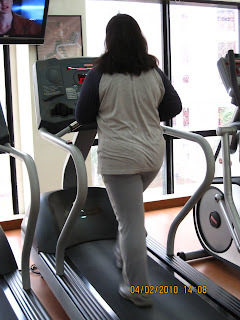 Is that you on the treadmill? Haha. No, it is not. I asked a friend to pose for me.